There are some settings that you'll need to enable to ensure that your account can receive Snaps from followers and accounts that you've set up to autoforward. Head to your Accounts page and scroll down below your account status and make sure that you have 'Capture Incoming Snaps' checked, and that 'Who Can Send Me Snaps' is set to 'Everyone'. 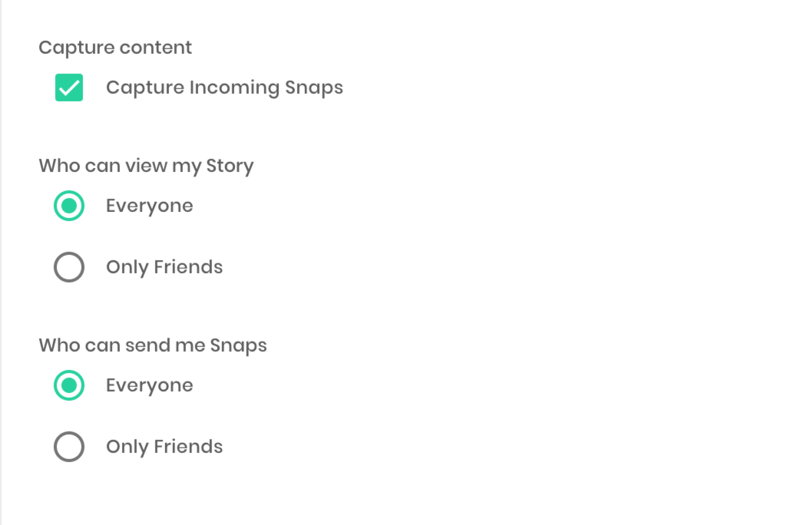 Opening up the 'Who Can Send Me Snaps' setting will allow you to receive snaps from all accounts, whether or not you are friends on Snapchat, which can be critical in gathering UGC. 'Capture Incoming Snaps' must be enabled so that Mish can save Snaps sent directly to your account. And while it's not directly related to being able to receive and save Snaps from others, we do recommend setting 'Who Can View My Story' to 'Everyone' so that anyone can follow your story or participate in your competition. Double check that your campaign runner or potential contest participants are sending live Snaps directly to your account, and not from their camera roll/memories or through chat. More often than not, this is the cause of Snaps not being received, so it's always a good idea to make sure everyone involved understands these guidelines. If you are logged into Snapchat on your phone and actively receiving Snaps that you may want to repost later using Mish, DO NOT view the Snaps on your phone as they come in. Doing so will cause the Snaps to disappear before Mish can store them. And while Mish is a magical tool that can do many wondrous things, bringing Snaps back from the dead is not possible. In this case, you will want to contact us to have your account connected as soon as you're done using the app on your phone, and all of your received Snaps should save to your account within ten minutes of reconnecting. Mish Guru can only update while your account is connected, so it never hurts to check in to make sure you are. You can check your connection status on the Accounts page. This is especially important if you are running a campaign using autoforward or if you're trying to curate and post UGC as quickly as it comes in. We advise that you refrain from logging in on your phone altogether during campaigns, but if you must, be sure to reconnect your account using the "Reconnect now" button on the Accounts page. If you're running an autoforward campaign, make sure that you've properly added the accounts that need access to your autoforward list. You can learn more about that here. Mish Guru software refires and displays updated data every ten minutes. If you're positive that your settings are correct and the sending guidelines were followed, the Snaps should come in within ten minutes. If you haven't received anything after ten minutes, please contact us so that we can look into what's causing the delay.